Engine 123 came to the Warren, Arkansas city park by way of Mexico, some corporate generosity, and a lot of local ingenuity and sweat equity. Engine 123 of the Southern Lumber Company in Bradley County, Arkansas started life as Engine 11 for the Morelia & Tacambaro Railway Co. of Guanajunto, Mexico. 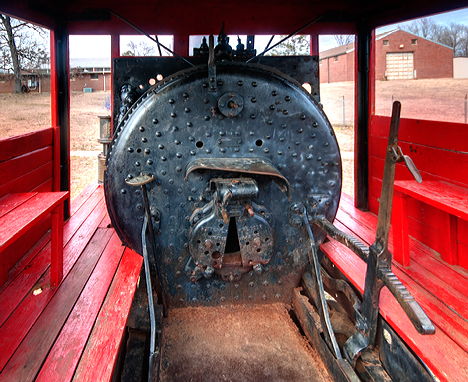 The 112 ton locomotive was built by the Baldwin Locomotive Works of Eddystone, Pennsylvania in 1907. 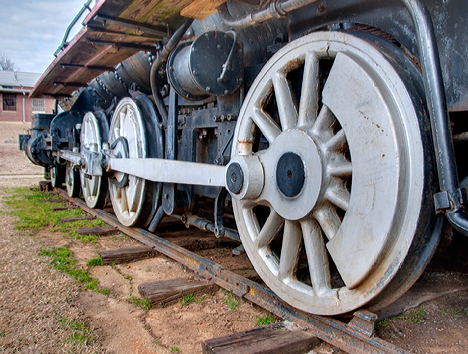 We’re not certain exactly when or what circumstances precipitated the sale and transfer of the locomotive from Mexico to Bradley County, and further, we have found no one more enlightened on the subject than we are. We are certain that this train story started on the Photo of the Week page at Corndancer dot Com, where you will find still yet more pictures and another story of an old locomotive. Click here to go there and see the start of this treatise. By 1955, the 123 had outlived its usefulness for the Southern Lumber Company. Company officials and the newly formed Kiwanis Club of Warren got their mutual acts together and hatched up a plan to save and restore the engine, which by that time had seen better days. 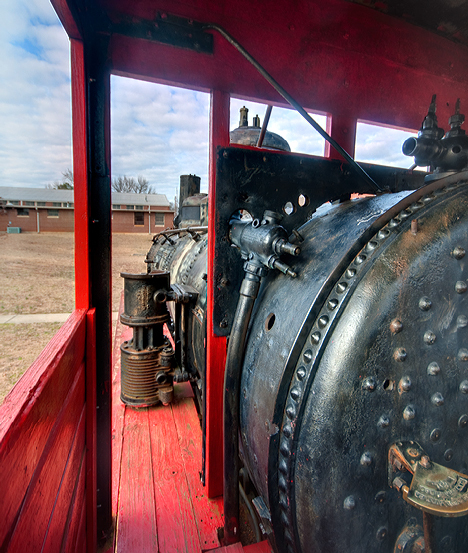 The company agreed to move the locomotive to the Warren City Park where Kiwanians would be responsible for restoration of the iron beast. The company laid a temporary track and huge bulldozers pushed it to the park. It’s been there ever since and gives evidence that is well appreciated. The steam cylinders which sent power to these massive 54" wheels are 18 inches in diameter with a 24 inch stroke. The tractive power was 18,288. Don't ask me what that means. There were a number of children (with attending parents) playing in the park when I arrived and started to shoot the old engine, just a few were playing on the old engine. Once I began to shoot, a few more gravitated to the iron horse, then a few more, you get the drift. When I climbed in the cab to get the shots below, it became a kid attack. Let me pause to say, this is not a bad thing. Curious kids crawling around on an old locomotive which was put there for, well, kids to crawl around on − it’s natural and expected behavior. Of course a crowd of squirming kids is the antithesis of circumstances conducive to tripod photography. Fortunately, there is the attention span syndrome. These kids manifested the behavior magnificently, so I got several two minute shooting breaks between kid attacks. I had to bite my tongue to keep from laughing. I noticed as the kid crowd grew, so did the proximity of the parents to the engine. I was a stranger and their kids were close by. They (the parents) were doing what they were supposed to do under those circumstances. Even though I was viewed with some suspicion, it was encouraging to see this display of parental responsibility, There is something to be said for small town America. Get a load of the engineer's view as the train would have sped on its way. Under the best of circumstances, there would not have been a National Guard Armory across the tracks. Engine 123 is a good example of how individuals can make a difference. Think about it. 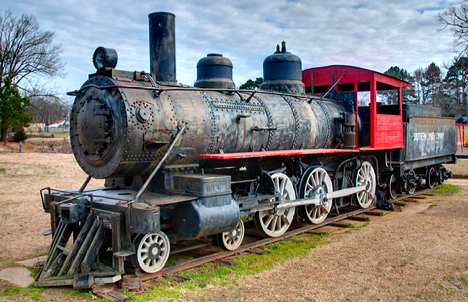 Here’s a 104 year old locomotive which has provided fun and entertainment for families for more than a half-century − all because somebody had an idea. That somebody recruited some friends and put legs on the idea. Now thousands have benefited, and since the engine is about as portable as the Rock of Gibraltar, there’s a high probability that the trend will continue. How refreshing. 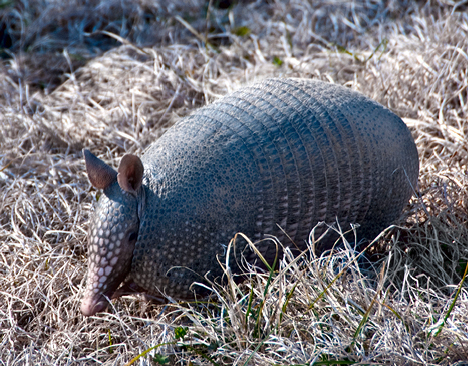 An armadillo grazes around on a levee for ants or other treats on an unusually balmy February afternoon last week. The well-acclimated critter was nice enough to hold the pose. Click here to see a gallery of this weeks pictures in a great looking format, not all all of which made it to Weekly Grist or Corndancer. 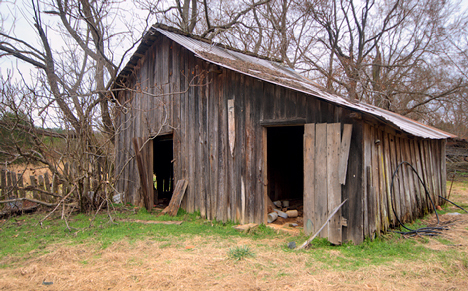 This old horse barn at Smead, Arkansas, was built in the early 1900s according to Bob Abbott, whose grandfather lived, worked, raised eight children and died on the home place where the barn sits. The shed overhang to the left was not part of the original structure. 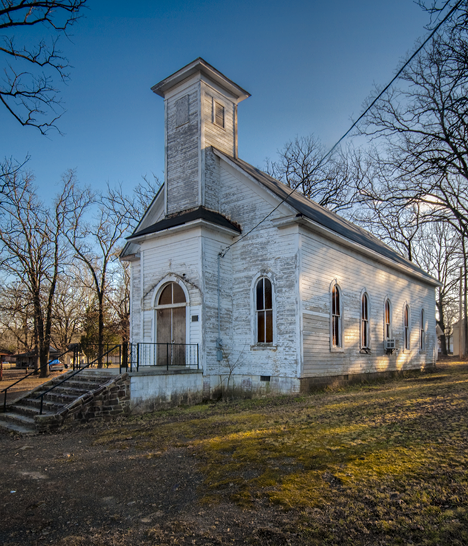 This is the second week we’ve visited the old home place at Smead, Arkansas, a first in the Weekly Grist collection of epistles. So much to shoot and such short days. Last week we shot the house and some out buildings. 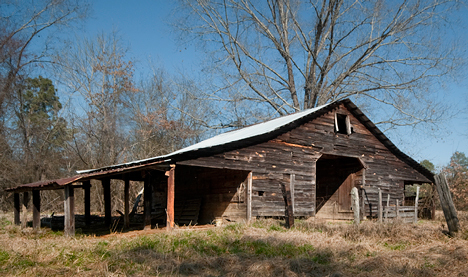 The barn is typical of the era. Get a good description of the barn and see three more pictures where this story started on the Photo of the Week Page at Corndancer dot com. Click here to go there, a cool thing to do. We’ll wait here while you look. When you arrive at the old home place, you are immediately checked out and greeted by this small ambassador for the Dodson family. 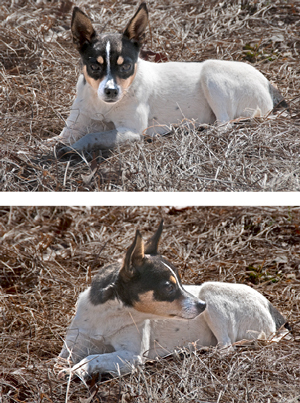 She appears to be mostly rat terrier. In the south, no rural home is complete without at least one dog. Really enlightened residents have more than one dog. This place is one of those. The dog in the picture is the smaller and friendlier of the two. She appears to believe that each different human being is a new two-legged toy. We have a Rottweiler with that mentality. She appears to be mostly rat terrier with a few neighborhood friends and neighbors tossed in to keep the gene pool well diversified. Most of these smaller terrier dogs I’ve seen are frenetic barkers. Not this one. She followed me around and watched what I did. When I beckoned her, she came forth to lick me and be scratched and petted in return. We then went on our ways, me to shoot, and her to watch until the next affection session. What a concept! 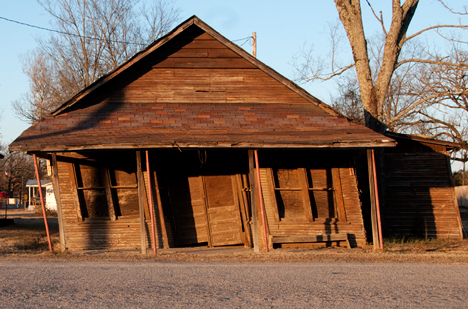 One can only admire the sturdy construction of this great barn. Now clocking along for 90-plus years, it is wearing well. Nothing fancy here, but strong and functional. The gate latch was supplemented, no doubt by a small chain. Look at the indentation in the second gate slat from the right and you will see a where the chain wore the wood. The small chain snap-link above the wooden latch competed the chain circuit. 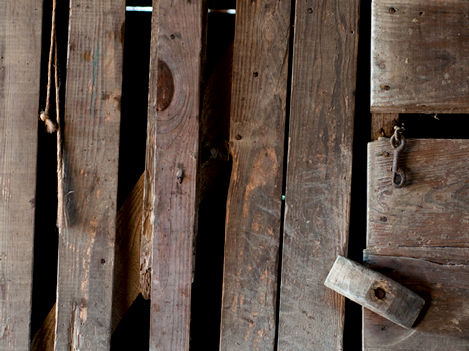 Since the wooden latch was reachable by a child, the chain provided the insurance to keep critters and kids in their proper and respective places. Taking a closer look at the gate latch, you can see the tool marks where the craftsman made the latch by hand. 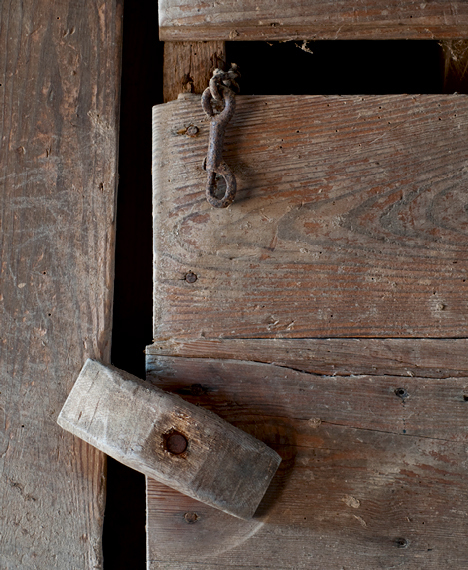 Look closely to see the hand-hewn tool marks on this 90-plus year old latch. DeWalt, Ryobi, and Black and Decker and the like were not even a figment of anyone's imagination when the craftsman carved away everything that was not a gate latch. It still works. End of story. We conjectured that a cantankerous mule or horse probably dispatched the lower rung and upright of the loft ladder in the barn. "It's been that way since I can remember," says Bob Abbott. His grandfather was the owner of the barn. 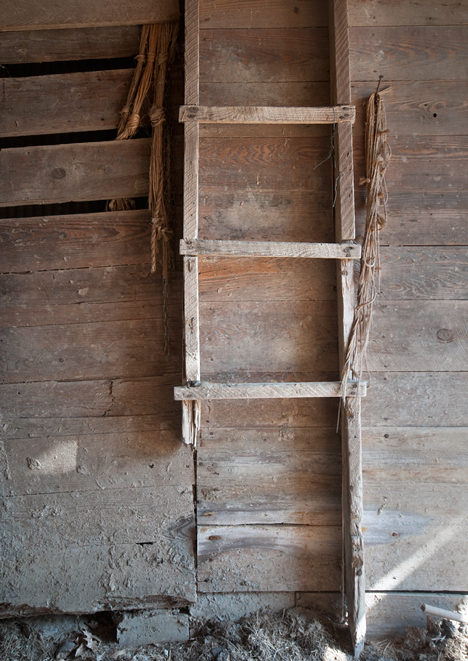 That broken rung probably kept Bob and his siblings out of that loft while they were still at a tender age, but charged with curiosity which nearly always results in cuts, bruises and breaks. A wise and discerning Grandpa takes advantage of such a barrier. This was Holly Springs School where Smead kids got their first exposure to the three "R's." 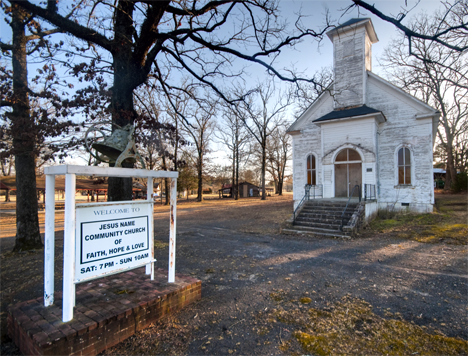 A few miles east of Smead is another small community, Holly Springs. 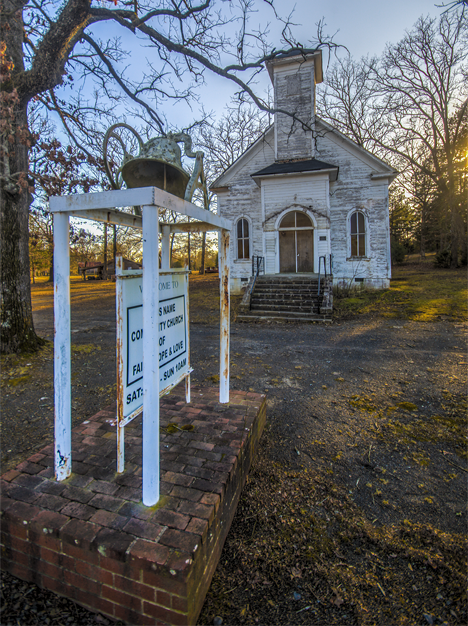 Unlike Smead, Holly Springs is alive and well with a church and a well-managed community store. It’s not big, but it is a good community. The old school building above, after a round of school consolidation and a stint as a community center, now belongs to a local church. 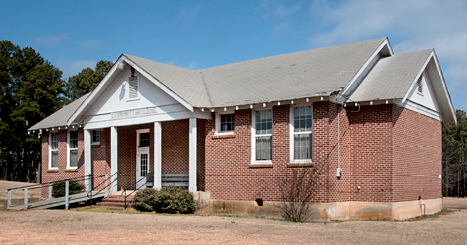 According to local sources the school was built in 1930 or 31. Prior to this building, grades one-twelve were taught in an older frame structure. Grades one through eight were taught in this school. Students in grades nine through twelve were bussed to Sparkman, Arkansas. The roads, then, not being what they are not, did not facilitate rapid movement of the buses. Long waits for short rides were de rigueur for the times. Amazingly, the aggregation of unsupervised young Arkansans charged with pre-pubescent energy, with too much time on their hands (the older ones were just beginning to feel hormonal stirrings), did not perpetrate a wave of juvenile misbehavior. A normal set of circumstances 60 years ago. A bizarre miracle now. Sixteen pictures from eight gigs of shots made the short list for this story. Not all of them made the cut. Click here to see a high-resolution gallery of all 16 shots including the smoke house with moss on the roof, a second shot of the old smoke house, and old broken brick and the old home. The cedar tree in the foreground may well be older than the house. The house was built in the late 1800s. When the tree was a sapling, we don't know. One thing we do know, it displays the gnarled and scarred characteristics of old cedar trees − the looks of a hardy survivor. 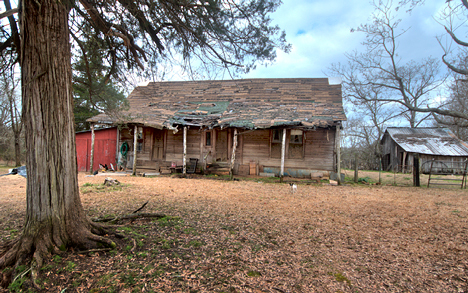 The old house, and not a lot else, is at Smead, Arkansas. It is the childhood home of my friend Bob Abbott who graciously pointed me in the direction of his former domicile. 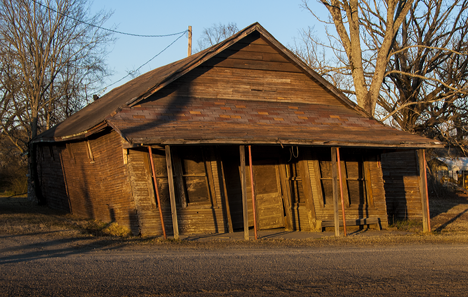 The story of the old house started on the Photo of the Week page at Corndancer dot com. To see how the story started plus two other pictures, click here, a very cool thing to do. From the front, the old home almost appears marginally habitable. Unfortunately, looks, in this case are deceiving. The house faces east, as you see it above. The rub is, the weather, in this neck of the woods, mainly comes to us from the west. So the back of the house, for well over 100 years, has taken the worst hissy-fits Mother Nature can pitch, on the chin. It has collapsed in several places. Left, "outside looking IN, with the front door open, you can see down a hall where the back wall of that part of the house has collapsed. Right, looking OUT the same door, it is almost good enough to tell your friends to "come on in and make yourself at home." The house was originally of the dog-trot style, common in that day and time. 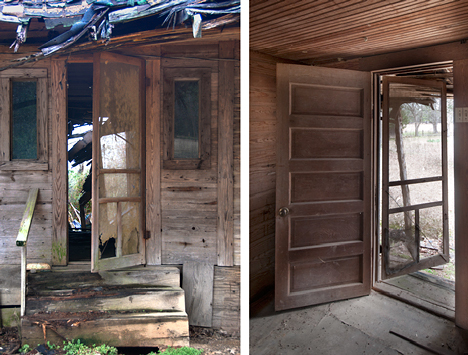 Although the domicile was under one roof, there were two distinct areas separated by a breezeway. Usually, one side was for cooking and passing the time of day and the other side was for sleeping. At some time, the breezeway ends were closed and it became a giant hallway. The front door is just out of view to the right hand side of the pictujre. 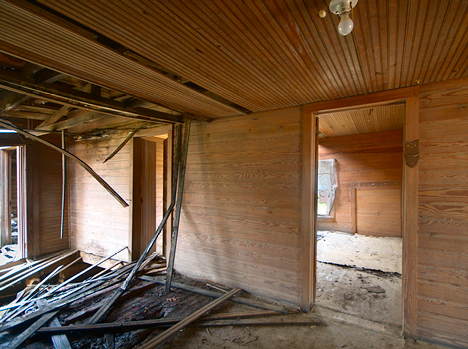 The first room has all the appearances of a living or "front" room. This hall was originally a breezeway. The ceiling material is "beadboard," a popular milled wood stripping of the time. There is a dirt dauber nest by the ceiling light fixture. Rural residents of the era of this house almost always had some livestock for food and work. These critters require accommodations, most always manifested as a barn. 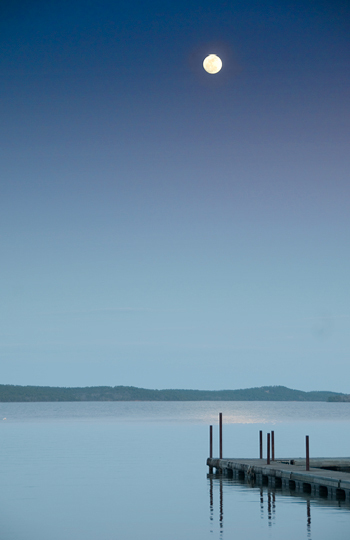 This location was not exception. There are two barns on the property, a cow barn and a horse barn. The cow barn is below. The left side is for the cows. The right side is a tool shed, hay storage area and general purpose hideout. The smoke house/tool shed is in better condition than the house. We’ll have more on this location next week. More looks at the house and nosing around the barns. There always more questions asked than answered on these explorations, but perhaps that’s the appeal. I am running a bit late this evening. Production was halted while I watched one of my fondest wishes come true during Super Bowl 44. Geaux Saints. Who Dat? Click here to see a gallery of 21 high resolution pictures from this location, including those you have seen here and on the Corndancer Photo of the Week page. We always shoot more than we have room to publish.